Fun fact about Elizabeth Warren: She LOVES Pride Parades. The dancing, the music, the sunshine (we hope), and – most importantly – the huge, welcoming crowds affirming that love is love. Elizabeth is counting down the days until the Boston Pride Parade. And no matter where or how you’re celebrating, for yourself or the people you love, you can commemorate Pride Month with her! Grab one (or a few!) 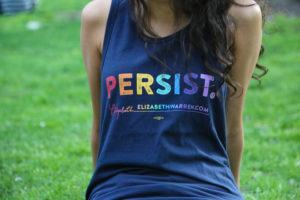 of our brand-new, limited-edition “Persist With Pride” t-shirts and tank tops, now available in the official ElizabethWarren.com store. Get yours today before we run out! We will persist with pride to continue fighting anti-LGBTQ discrimination everywhere – in schools, in workplaces, in the armed forces, in bathrooms, and in every aspect of life, from getting health care and housing to walking down the aisle. No matter how you identify or who you love, Elizabeth has your back. So, get all decked out, get your Pride playlist ready, and don’t forget your sunscreen (especially if you choose the tank top). P.S. Don’t forget to show off your new Pride gear! Take selfies/groupies of yourself and your friends in your shirts, and share them on social media with #PersistWithPride. We can’t wait to see your photos!